Description of "Because My Heart Beeps For You"
What happens when the thing you expect the least, strikes you and leaves you in a world of dilemma? Life is a tour of mysteries and much more. Vivaan is a jolly Mumbaiker with certain problems which are hard to overcome while Shruti is a Kolkata girl. Both of them are pursuing MBA in the same college. They meet through an incident and gradually fall in love. Aisha is Vivaan’s doctor and they are best friends. Vivaan has shifted to Kolkata for pursuing his course. He stays with his mother and leads a happy to go life. Vivaan hides his worries from everybody but somehow it gets revealed. This story is all about love, sacrifices, loyalty and belief in true love. As the story progresses it leaves you drenched in the puddle of love. …Because My Heart Beeps For You will show you a new form of love. It will leave you in a world of mysteries and feelings of persons. The author is currently a student pursuing engineering in Kolkata. 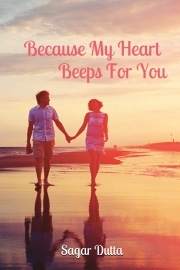 Reviews of "Because My Heart Beeps For You"